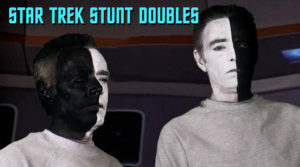 Star Trek STUNT DOUBLES doubles its offerings! Ah, how do I describe STAR TREK STUNT DOUBLES to the uninitiated? The words wacky, zany, low-budget, irreverent, unpredictable, funny, low-budget, inspired, creative, one-man show, clever, did I mention low-budget?, wild, crazy, thr0w-caution-to-the-wind, Star Trek fan film parody vignette series all seem to get close…but not quite there yet. 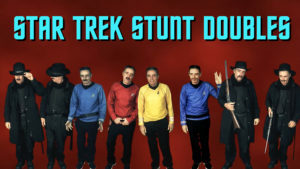 Star Trek Stunt Doubles is a “I’m doing it my way, marching to the beat of my own drummer, if you don’t like it then don’t watch it” labor of love that, to me, is what fan films are all about. And you may very well not like it. That’s okay. Personally, I love it because I never know what’s coming next. Most of the time, it’s word-for-word recreations of scenes from classic TOS Star Trek episodes, lovingly crafted and redone by one guy in front of a green screen wearing uniforms, costumes, make-up, wigs, fake mustaches, and lord knows what else! Then, just when you least expect it, a character will say something that leaves your head spinning in the What-The-Frak??? moment of weirdness and humor. As I said, I never know what’s coming and when. And hey, if you don’t like what you see, nearly all the episodes have runtimes of only between 2 and 5 minutes. So Stunt Doubles is hardly much of a time investment. But if you look closely, you’ll realize just how much time and effort its creator, who goes only by the name MrBonk85, has to put in even to get this ultra-low budget fan production done. After all, HE is playing every part! And where does he find all those costumes??? At the time, there were seven Stunt Doubles episodes that had been released: vignette parodies of “The Enemy Within,” “Spectre of the Gun,” “Where No Man Has Gone Before,” “This Side of Paradise,” and “Charlie X”…plus two original shorts not based on specific TOS episodes. MrBonk85 ended our interview saying he wasn’t sure if he’d be making any more parody vignettes in the future. Well, guess who has released SIX more episodes since then…! 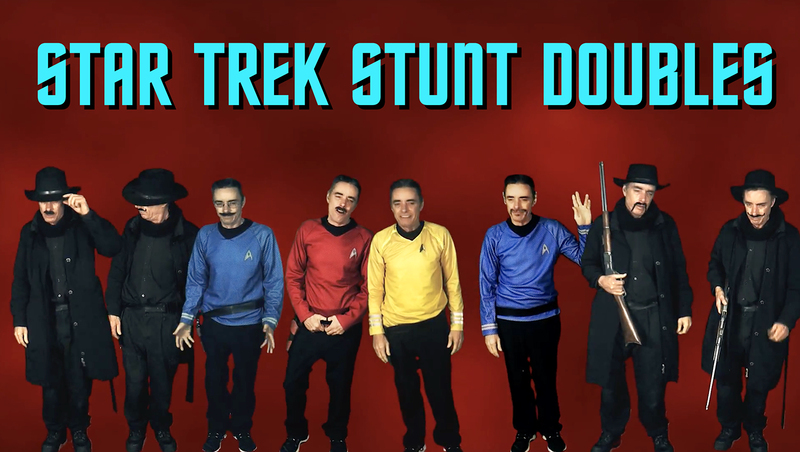 You can access all of the Stunt Doubles episodes here on this YouTube playlist. You can binge-watch the whole kit-n-kaboodle in about 52 minutes. Watched Nomad, and the Captain eating a kids meal was down right funny! The graphics were better than I thought they would be at first. Easy to think they are real sets. I’ve told Uhaura to go to the Gym, but frankly I don’t think it will help. Glad you got a chuckle. Previous Previous post: Finishing touches – ALEC PETERS updates AXANAR supporters on the ARES BRIDGE set! 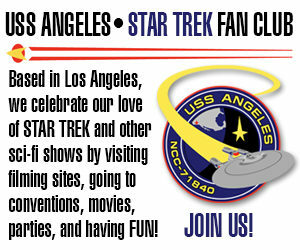 Next Next post: Coming in 3 days: the BLOGGER-BATTLE OF AXANAR!